MacOS Native SSH is different than some of the other SFTP Servers we have reviewed in that it is only for MacOS X and it is built into the OsX Software. 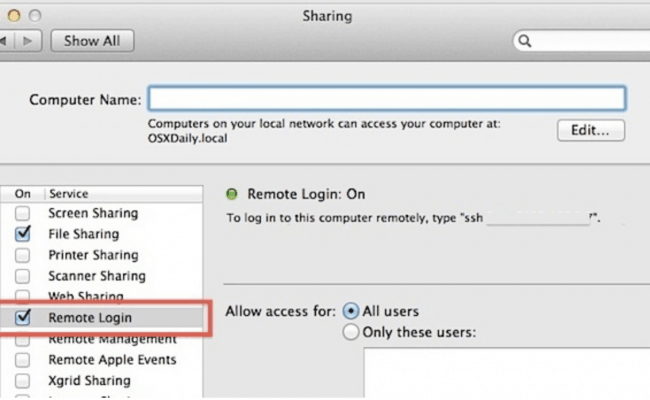 To activate this feature, you enable it through the SSH server within the MacOSX Sharing Dialog Box. Built into the MacOS so no additional configurations are required in order to use it. Go to System Preferences -> Sharing Applet, then click the checkbox next to Remote Login, where this will turn on the SSH Server for all system users. Allows remote users to connect to a MAC by using the OpenSSH protocols and a corresponding SSH Client. Widely supported and Easy to use protocol for Secure File Transfers. 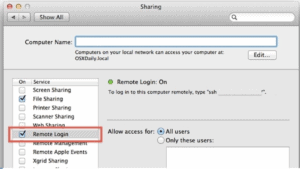 Account Permissions are used to delegate access to each individual user, controlling what files and directories they can view when connected. Only Available for Apple Mac OSx, as it comes pre-bundled with the OS Software. Go to System Preferences -> Sharing Applet, then click the checkbox next to Remote Login, where this will turn on the SSH Server for all system users.